The weather wasn't quite perfect in the morning. I was disappointed that it was partly cloudy. How quickly I had become spoiled! Then when I walked into the hotel garage to unlock my bike, I had a moment of panic. The bikes were gone! But before I had a stroke, I saw that they had moved across the garage -- no easy feat with the bikes locked together. As long as they were there, all was right with the world. It was easy to exit the walled town, since there was an eastward gate very near to our hotel. Right outside the gate we stopped to set our GPS and steady our panniers. It always took a little while to get everything right in the morning. This was to be the easiest day of the trip, as the road along the bay to Mont. 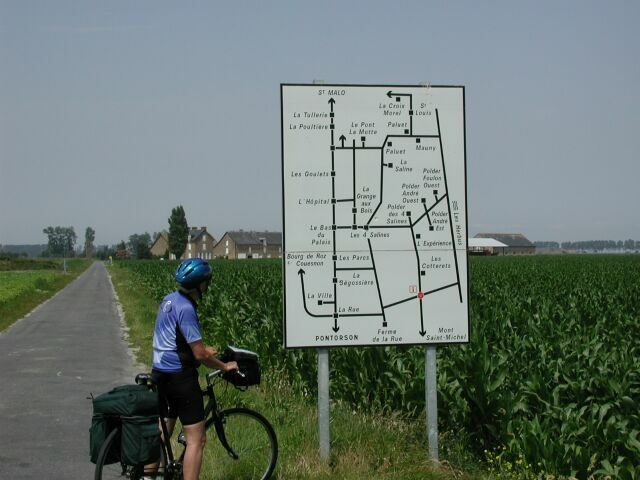 St.-Michel was flat and easy to navigate. 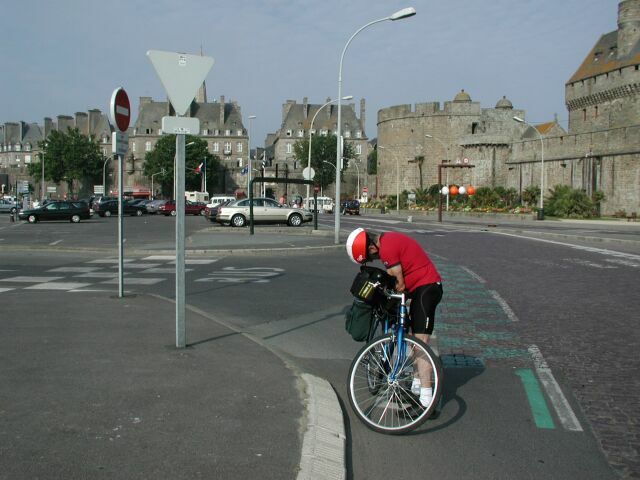 All we had to do was to keep to the bay, but we got started badly, heading south back through traffic lights into the main town of St. Malo. After a half mile or so we realized that we had missed a turn. 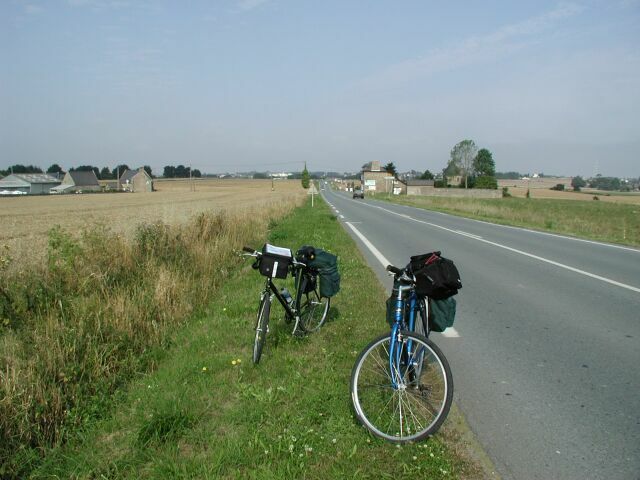 We retraced our route, which I always hate doing, and climbed the only hill of the day, a mild one leading east out of St. Malo. After a few blocks of traffic we suddenly found ourselves on the main highway to Mont. St.-Michel. Traffic was moderate to low and the road was straight with enough room for bikes on the side. It was easy to make good time. We stopped to look at some pigs, which sounds kind of silly, but it's the kind of thing you do on a bike. Then after a lonely traffic light at a highway crossing I biked fast down a hill, gaining momentum for the uphill. It never quite works, of course, and when I ran out of steam I stopped to check Len behind me. But he wasn't there. I waited and waited, and he didn't show up on the highway behind me. I started to think about how we should have made arrangements about what to do or where to meet. Finally, I started back, and just then I saw him coming over the far hill. He'd had some trouble with his chain, and I hadn't been paying attention to my rearview mirror. We never did make any emergency arrangements though. Studying the map ahead of the trip I had imagined that this road would have beautiful views all along the way, since it skirted the bay, but I was disappointed. 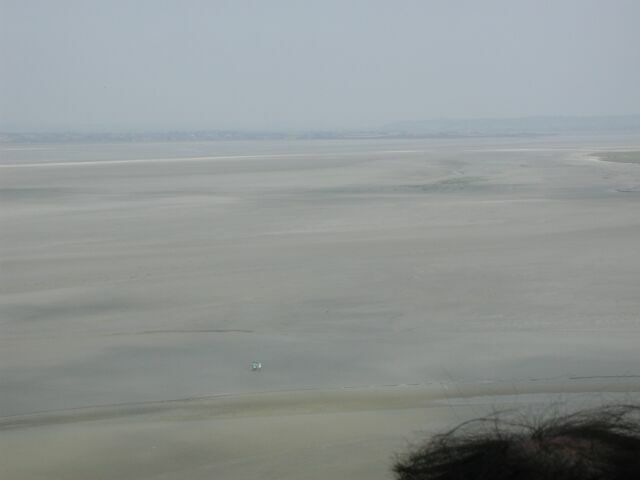 After the farms of the early going, there were only ugly mud flats leading to an unseen and distant bay. The tide was out, and we saw stranded boats like these. On the other side of the road we stopped at a little bridge, and I took this pretty picture of a man and a boy walking alongside a stream. 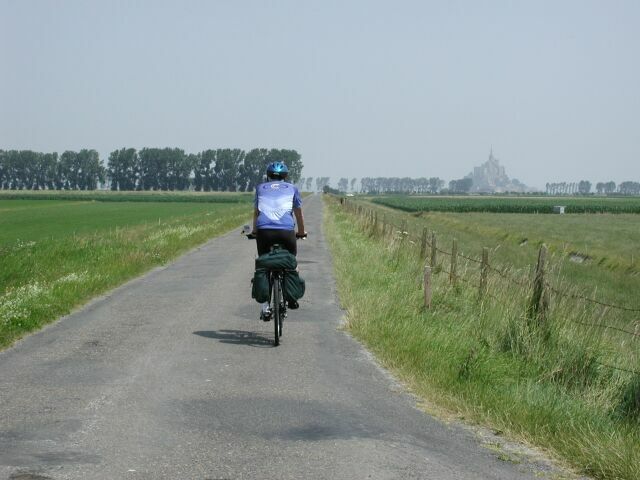 Some miles later we began to see cyclists silhouetted against the sky on an invisible road nearer the bay than ours. They appeared to be riding up on top of some sort of dyke. At the next opportunity we took a small road towards the bay and discovered a short road along a mound overlooking the extensive mud flats. 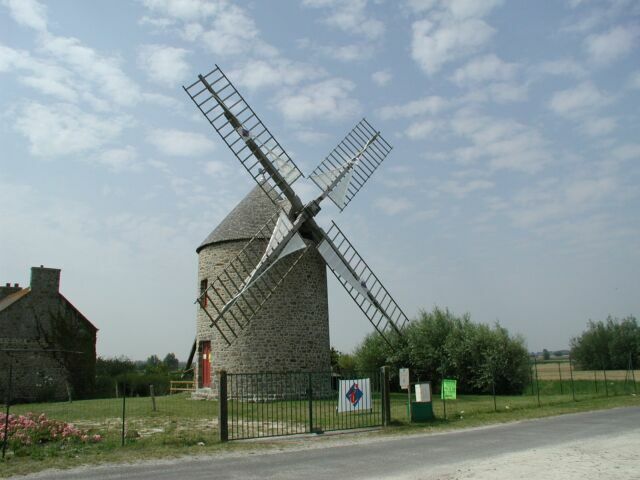 There was a pretty windmill, and I had promised a friend that I would bring back a picture of a windmill in Normandy, so I took this one. I wasn't sure if I was in Normandy yet, but I didn't know if I'd see another one. So this would do. 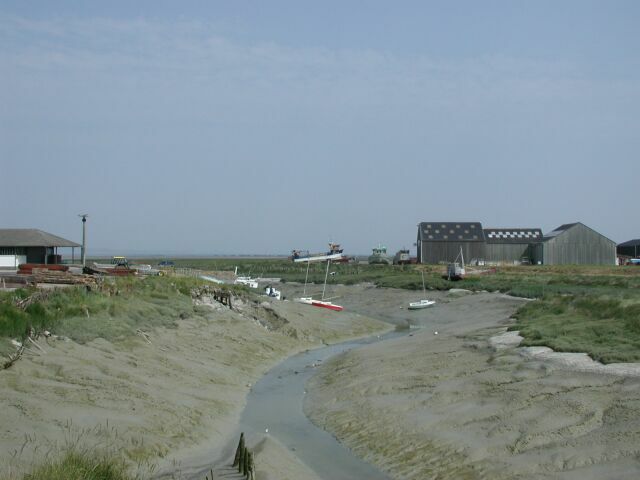 I parked my bike across from the windmill and ate a peach and a nutri-bar while Len walked out on the mudflats. This would have to do for lunch, unfortunately. According to the detailed map there was a secondary road available shortly for a few miles that would allow us an alternative to the main highway. The biking on this small farm road was instantly more comfortable and interesting as we left the mud flats and all the cars behind us. But all good things end, and so did this road. We rejoined the main highway, which had now changed in character, having gone inland away from the mud flats. We paralleled a hill that formed a backdrop to farms like this one. The main road curved south away from the bay and Mont-St.-Michel. Between us and the bay were a number of farm roads laid out haphazardly, apparently along property lines. We took an arbitrary road towards the north, and Len stopped for another adjustment of his fickle GPS. You can see the main road at the foot of the hill behind us. We soon reached an unmarked intersection. Which way should we go? The GPSs weren't much help, since it wasn't clear which direction would lead us towards the bridge that we needed to cross to get to Mont-St.-Michel. We took an arbitrary direction, and for the first and only time on our trip, we encountered a road map on a sign -- right there in the middle of nowhere! Len stared at the map for awhile and shrugged his shoulders. I took my turn trying to decipher it, and soon gave up. 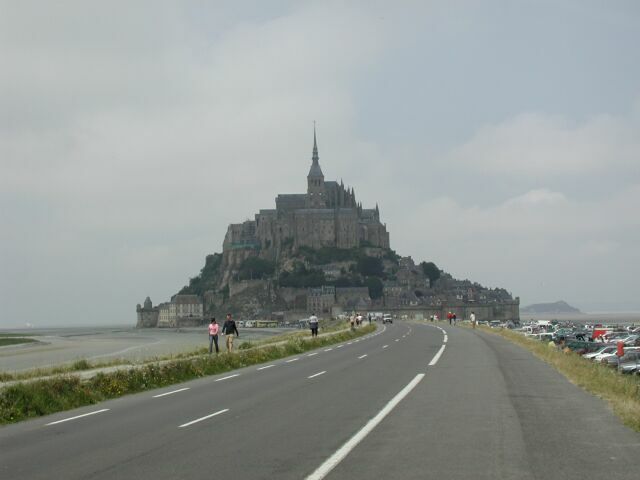 We had no idea where we supposed to go to get to Mont-St.-Michel. Once again we took an arbitrary direction. We weren't getting anywhere, but it was easy biking and fun. We weren't in a hurry either. 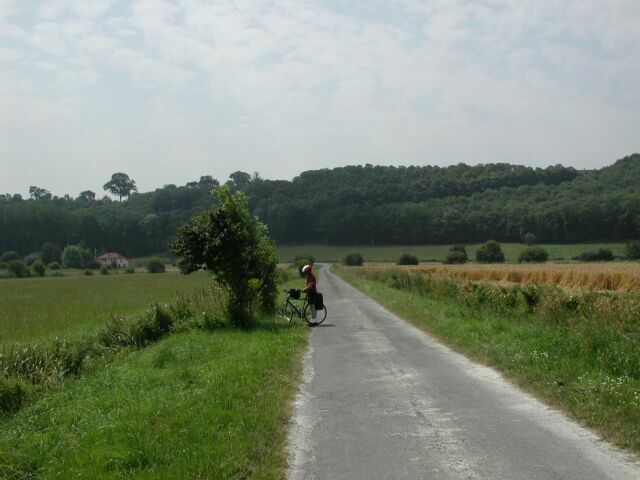 While we were biking along aimlessly, we saw a number of other cyclists on nearby roads. 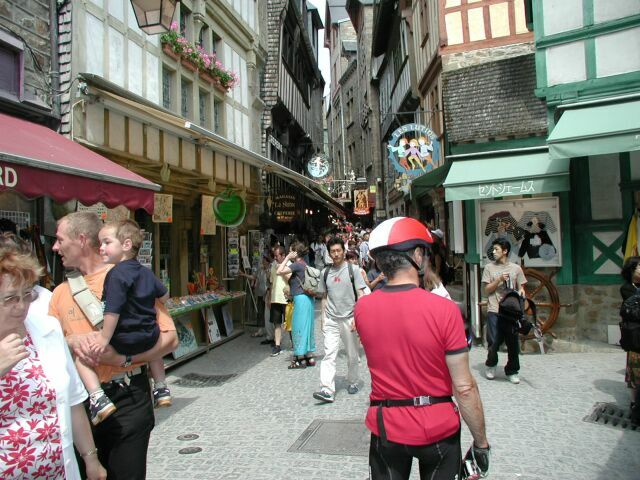 We got the idea that these bikers must be coming from Mont-St.-Michel, and that if we followed the roads from which they had come, we would be heading the right direction. After the next turn, we got our first view of the abbey off in the distance. It was an exhilarating sight, and one that would be with us for the next day of traveling. This is my favorite picture of the trip. I said that the day had begun partly cloudy, but now it was beautifully clear. The temperature was perfect, the road was flat, there was no traffic, and this wonderful mirage was beckoning in the distance. All biking should be like this. 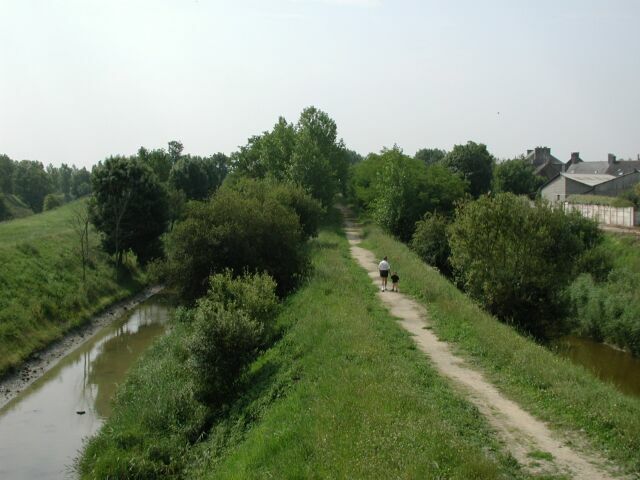 Soon we reached the little bridge that led to the causeway towards the abbey. Our hotel, the Hotel La Digue, was along this causeway, and we stopped to get our rooms for the night. 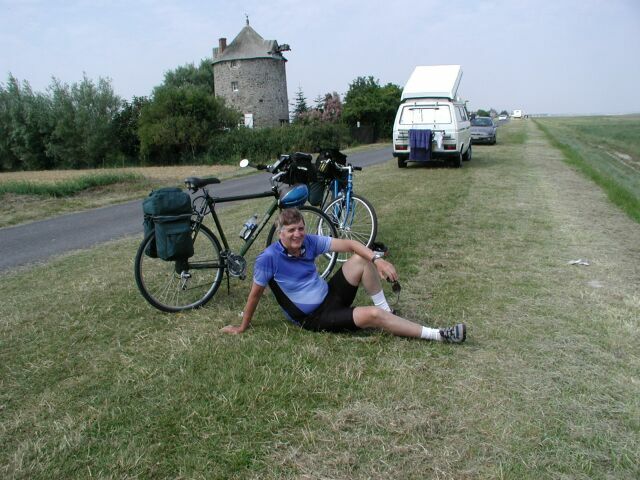 We put our panniers in our rooms, and rode our bikes along the causeway towards the abbey. The bike felt weird without the awkward weight of the panniers. Somehow it was more natural by now that it should be heavy and unstable. It was fun to pass all the pedestrians on the causeway and to bike pass the guard routing the cars to the parking lot. Sometimes being on a bike grants special access. We locked our bikes against the wall at the base of the abbey and walked up to the admission area. There we saw a big sign that warned about the incoming tide, which is famous here for its suddenness and extent. The sign said that the tide that day would come in at 3:30pm, which was in about 45 minutes or so. I had been to the abbey some years before, but this was Len's first trip there. He was visibly disappointed in it as we walked up the spiral road towards the summit. The little road was clogged with the worst kind of souvenir shops, ice cream stands (to which I succombed), and bars. We soon reached the entrance to the abbey itself at the top of the road. Tourists were lined up at every vantage point that overlooked the bay, as they waited for high tide to arrive. This would be a sight to behold, so we jostled for position and managed to get places where we could at least see the bay, if not comfortably. There were about 15 minutes to go before high tide. I could see some people walking far out in the sands below us. Surely they would be swept out to sea, I thought. A loudspeaker above us blared out across the sands. "Attention!" it said in French. "Danger!" it said in English. "Achtung!" And so forth in every known language. Maybe some unknown ones too. As the minutes ticked by towards the onset of the ominous tide, the tiny figures out in the sands continued their stroll, and not even in the direction of safety. Somebody should do something, I thought. I looked around us at the tourists gazing raptly outwards. They want blood, I thought. They want to see these people swept away. The appointed hour of high tide arrived. A quiet descended over the crowd as we waited for the torrential tide to arrive. Nothing happened. Maybe it's a little late today, I thought. We waited some more. Nothing happened. After about another 15 minutes and no visible sign of a tide, some people started to give up. Better viewpoint positions became open. The little stick figures of people out in the sands continued their oblivious stroll. After a half hour Len and I gave up too. This famous ferocious tide was a no show. We turned our back on the non-spectacle and bought tickets to tour the ancient abbey. The abbey tour was a disappointment too. There were a bunch of empty rooms and a non-descript chapel, where Len was admonished by a tour guide for not removing his bike helmet. We soon threaded our way out of the abbey, and on our way down we glanced out at the sands. Len said that he could see that the tide had come in some. I wasn't sure. In any event it wasn't obvious. As we biked back to our hotel I felt a sense of anti-climax. 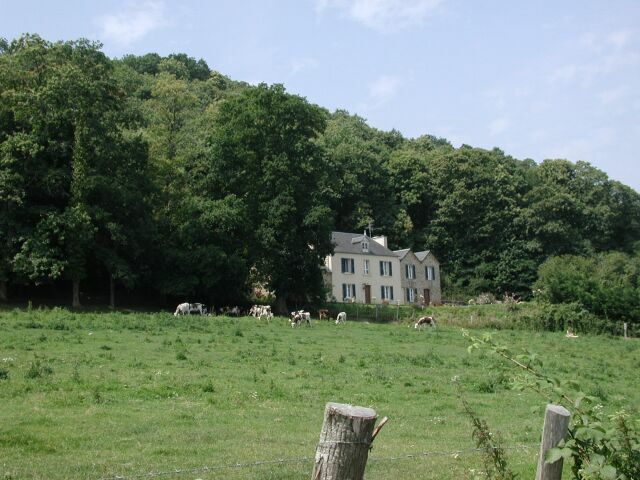 The abbey itself was disappointing, and there would be nothing to do in the evening in this remote location. 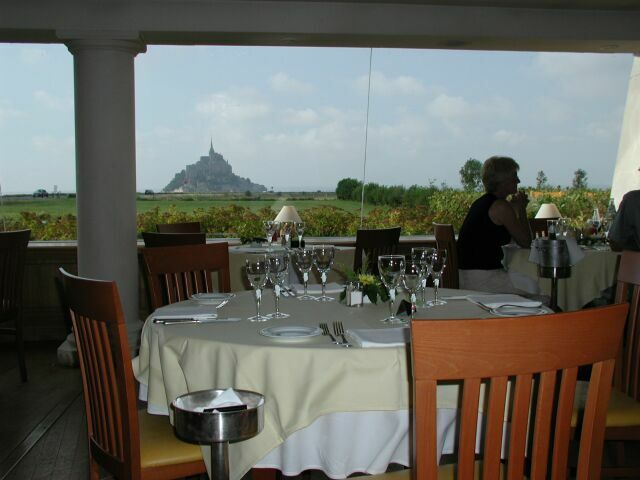 Really, the best part of Mont-St.-Michel is how it appears from a distance. The guidebooks will tell you different, of course, and they know what they're talking about. For dinner we walked across the street to another hotel, where we were able to have dinner with this magnificent view from our table. The food was so-so, and service was terrible. Try as we might, in French and English, we couldn't seem to get water. They gave us the wrong wine, and Len couldn't get the cheese that came with his meal. Afterwards, from the balcony of my room I looked out across the small river to see hundreds of sheep heading south on the opposite bank. No person or dog seemed to leading them. But I don't know much about sheep either. My last view before sleeping was the illuminated abbey in the darkness. It was, indeed, beautiful.